It's Monday morning, you are running late, you can't find your house keys and no matter how hard you try to retrace your steps you simply cannot recall where you put them. While extremely annoying, for most people not being able to recall information only happens from time to time and with no real impact on their quality of life. A brain section from a patient with Alzheimer's Disease. The section contains the hallmark features of Alzheimer's: amyloid plaques and neurofibrillary tangles. But people suffering from neurodegenerative diseases, such as Alzheimer's disease, often experience loss of memory and also impaired learning, which together lead to dementia. At the moment over 700,000 people in the UK live with dementia, but this number is expected to reach 1 million by 2025 and economists predict that the cost to the NHS of treating the disease will exceed £17 billion a year. So there is a real need to understand the causes of dementia and to discover ways to slow its progression, or reverse it. Challenging as that may be, recent research using transgenic mice has shown that it might be possible recover some memory functions and restore certain learning abilities previously lost to dementia. Dr Andre Fischer, from the European Neuroscience Institute at the University of Goettingen, used mice that had been genetically modified so that certain nerve cells (neurones) in the brain could be killed off on demand. 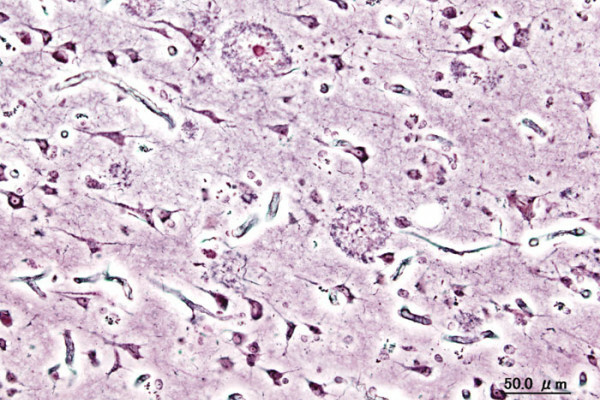 This cell loss mimicked the effects of some forms of neurodegenerative disease and resulted in forgetful mice that also struggled to learn new things, such as the escape route from a maze. But surprisingly, when the animals were placed in an enriched environment with access to running wheels, toys and hidden caches of food to sniff out, the previously amnesic mice began to remember and also regained their ability to learn. These results suggest that mental stimulation can undo the effects of neurodegenerative diseases on memory and learning. Furthermore, what works in a mouse could also apply to a human. "There is data supporting this view; people who lead an intellectually more challenging life have a significantly decreased risk to develop Alzheimer's," says Fischer, who also points out that physical activity could also have a beneficial effect. Yet while these observations provide valuable insights into the importance of physical and mental activity, exactly why these pursuits should have brain-boosting effects wasn't known. One possibility was that the memories had not been lost, but that the brain connections required to access them had been damaged, so living in an enriched environment facilitated their retrieval by promoting the formation of new connections. This would also explain why dementia patients can experience moments of clarity. In support of this theory, by examining the brains of their mice, the researchers found that the brain wasn't repairing itself by producing new neurones. Instead, exactly as they suspected, connections between the surviving neurones were being strengthed. The enriched environment appeared to be encouraging the formation of extra dendrites, which are the structures on nerve cell surfaces responsible for detecting input signals, and synapses, which are the neuronal junctions that send output signals. These modifications were enabling the existing neurones to make up for the loss of those that had been killed. But what was provoking the cells to alter their behaviour in this way? To find out the team turned to the mouse genome. Genes are not always expressed (switched on); they can be turned on or off and also up or down, like the volume of a stereo. One way of controlling when genes are switched on, and at what 'volume', is by changing the way DNA is packaged. DNA molecules are wound around protein spools called histones, which can be chemically changed by enzymes to tighten or relax the wound DNA, and this in turn can affect gene expression. A key enzyme in this process is histone deacetylase (HDAC), and by chemically blocking its action the researchers were able to mimic the effects of the enriched environment in the transgenic mice. This showed that access to 'lost' memories is likely to be achieved by inducing changes in the way the DNA is packaged, thus altering the expression of important genes. But exactly how the enriched environment triggered these these changes remains a mystery. Nevertheless, this research has yielded some important information that has the potential to greatly benefit people suffering with dementia. Not only has it confirmed the importance of a stimulating environment, but it has also revealed a potential drug target in the form of HDAC. Also, although this work was conducted on mice, there is reason to suspect that a similar mechanism plays outs in humans. As Fischer points out, "HDAC inhibitors are already in clinical trials, or approved for use to treat various forms of cancer", so translating them to the clinic shouldn't take too long. The discovery also brings a glimmer hope for people with brain injuries since HDAC inhibitors might also be able encourage the re-wiring of healthy parts of the brain to compensate for damage to other regions of the nervous system, although this remains to be tested. In the meantime, though, if you want to protect yourself from the effects of neuronal degeneration, it looks like a daily dose of "Countdown" and a cryptic crossword, or even studying for an OU degree in quantum physics, could be the answer!